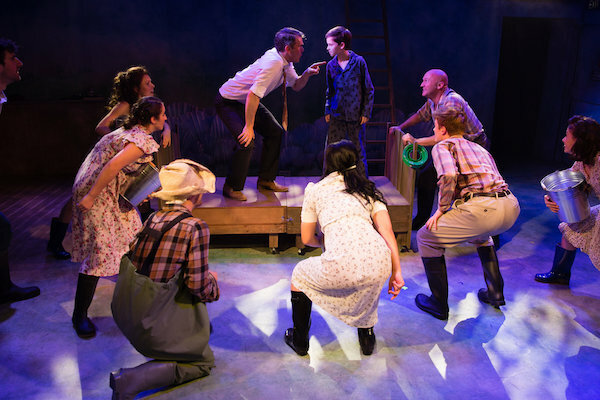 With such a BIG story to be told in such an intimate space, the cast and crew of Big Fish have certainly captured the essence of the production without compromise. The story of Edward Bloom is one of magic, love, heartbreak, excitement and larger than life tales. The show really captures all of these aspects and more as it takes you on the journey, with each additional character you meet along the way adding another layer to the story. RPG Productions presents its first ever main stage production, the Australian Premiere of Big Fish, at Hayes Theatre Co from 18 April to 14 May. Based on the celebrated novel by Daniel Wallace and the acclaimed film directed by Tim Burton, the story centres on Edward Bloom, a traveling salesman who lives life to its fullest. Edward is a dreamer, and his incredible, larger-than-life stories thrill everyone around him – most of all, his devoted wife Sandra. But their son Will, about to have a child of his own, is determined to find the truth behind his father’s epic tales. Phillip Lowe played the part of Edward Bloom brilliantly, giving so much energy and charisma to the role that he sucked you in and took you on the journey right along with him. Despite not being able to sing the vocals himself on this occasion due ti temporary illness (Director Tyran Parke sang vocals for him! ), Phillip gave such a performance it went unnoticed that it wasn’t he himself singing. It was a good cover considering the ‘show must go on’! Adam Rennie as the son William Bloom was also exceptional. His vocals alone were outstanding and he had you seeing his point of view, which just made the show all the more conflicting with emotion. Every character that you met along Edward’s life added another level to the overall story and by the end most of the audience had tears in their eyes – I know I certainly did. Cameron Mitchell’s choreography was very well done for the space and style of the production; simple yet effective. The music was fantastic, the show itself is well written and has been perfectly adapted from being such a big scale musical to fit The Hayes Theatre’s more intimate setting. Big Fish is an unlikely musical. It is sentimental, whimsical and tells the story of fathers and sons, despite there being no great dramatic plot twists. However, it was one of the most emotional and enchanting theatre experiences I have had in some time. Be surprised and see Big Fish before it closes on May 14. >> Read our interview with BIG FISH choreographer Cameron Mitchell.